What makes Delta look so good to a United Flyer. Wow, right? For a blog that primary focus is on United Airlines (with a side of Taco Bueno), it's strange to think that I would title a post like that. I know that everyone is frustrated with changes to the Mileage Plus redemption structure, but I still believe it is the best Airline Loyalty program out there. So, what could make me walk away? Last year I accrued 170 thousand EQM (elite qualifying miles), and 221 EQS (elite qualifying segments). I only needed 100K in miles and 120 points to get to Premier 1K (learn about United's status levels here). So what happens at the end of the year to those left over points and miles? Nothing. It's all for not. I almost stopped flying United once I made 1K so that I could earn something more than miles. You see, I love to set goals, and now all I'm working for are additional upgrades that I rarely use. Marriott has given rollover nights for years. What ever I earn after my 75 nights, rolls to the next year. This is the most amazing thing in the world for me because it allows me the freedom to not have to travel as hard one year if I'm needing to be at the office more. It’s easier to earn status with the only Medallion Qualification Miles (MQMs) that roll right into the next year. This exclusive Medallion benefit allows you to keep MQMs earned above your qualification level at the end of the year to help qualify for Medallion status the following year. Don't believe me... read it here (scroll down to the rollover mqm section). For me, it's worth being able to work towards next year's program today. I know that I will ever switch airlines. But, just maybe, United will read this and consider it. Screen Shot from Delta's Website. So this year I became a Global Services Member on United. There's a lot of people who speculate on how to get GS, but it's pretty straight forward. Spend a lot of money. An airline is just like any other company, they need to meet certain bottom line goals. To do that, United needs people to purchase F, A, Y, and B fares (I point these out because they make the most money). So why don't they do things to encourage that? 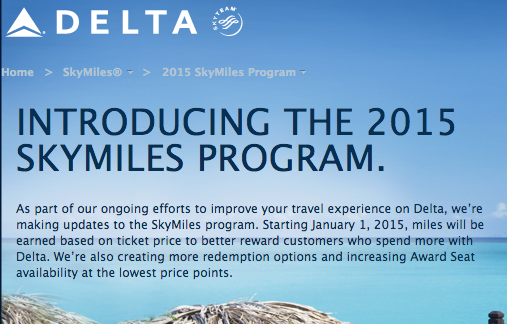 When Delta announced their 2015 SkyMiles program I actually got excited. The whole idea is stolen right out of Southwest's playbook. Earn miles based on spend, not miles traveled. And then they give bonuses based on what status the person is. To get status they have to spend money. It is a beautiful thing for a business, and even better for a flyer like me. Ask United, they will tell you that I spend a lot of money with them. Think about how much I would love to earn those types of miles. But the truth is I won't be switching to Delta. I still don't believe that their redemption rate is better, nor do I believe that their service or route structure matches United's. More importantly, I believe that United is, on all accounts, the best airline in the world -- from customer service, to fleet, to loyalty program. It just makes me think. Delta takes a play right out of Southwest's playbook. The United Airlines Fleet Website is a great place to learn all about the plane you are traveling on. I highly suggest that you go visit.